Given the continued projected shortage of skilled welders, one can only expect the number of women in the welding industry to grow… and with that growth, a demand for welding apparel that fits well. We all know that women are shaped differently than men. 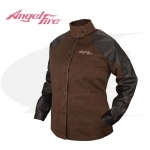 But did you know that AngelFire is not the only welding apparel for women? Miller is introducing a new women’s line of their Arc Armor® apparel. This entry was posted in Arc-Zone.com News, Miller, Welding Industry News, Welding Safety on November 27, 2013 by Carmen. Congratulations to Kay Minto, a TIG welder with 28 years experience, who won the Miller Everyday Welding Hero grand prize! She’ll get a trip to Appleton Wisconsin to visit the Miller headquarters, and some premium welding equipment: a Diversion 180 TIG welder, an Arc Armor Performance Pak. This entry was posted in Miller, Welding Industry News on September 6, 2012 by Carmen. The hottest thing on the internet… in case you haven’t been paying attention… is video. It’s a great way to share information with customers, and Miller Electric has joined the party! AND just a note. The videos are available for streaming, not download! There’s some good basic information. Pipe welders may be interested in some of the purge gas equipment that Arc-Zone.com carries: purge bladders, weld tape, water soluble purge film and tape. This entry was posted in Miller, Welding How-To, Welding Industry News on June 23, 2008 by Carmen. More amps for your buck! Now Arc-Zone.com doesn’t sell welding machines at this time, however, if you want to make sure you get the most out of your new Dynasty, or whatever your TIG Welding machine, give Arc-Zone.com a call, drop by the online webstore. We’ll set you up with the best TIG Torch for your application, and make sure you’re getting the most out of your machine. This entry was posted in Miller, Welding Product Reviews on March 16, 2007 by Carmen.